I used to think Texas vs. California was the most interesting and revealing rivalry among states. It was even the source of some clever jokes and cartoons. But the growing battle between Florida vs. New York may now be even more newsworthy. I wrote last month about how many entrepreneurs, investors and business owners are escaping bad tax policy by moving from the Empire State to the Sunshine State. Not that we should be surprised. Florida ranks #1 for economic freedom while New York languishes in last place. A big reason for the difference is that Florida has no state income tax, which compares very favorably to the punitive system in New York. And because the federal tax code no longer provides an unlimited deduction for state and local taxes, I expect the exodus from New York to Florida to accelerate. What’s especially amusing is that Alexandria Ocasio-Cortez’s mother is one of the tax refugees. Here are some excerpts from a report in the New York Post. The mother of soak-the-rich Congresswoman Alexandria Ocasio-Cortez said she was forced to flee the Big Apple and move to Florida because the property taxes were so high. “I was paying $10,000 a year in real estate taxes up north. I’m paying $600 a year in Florida. 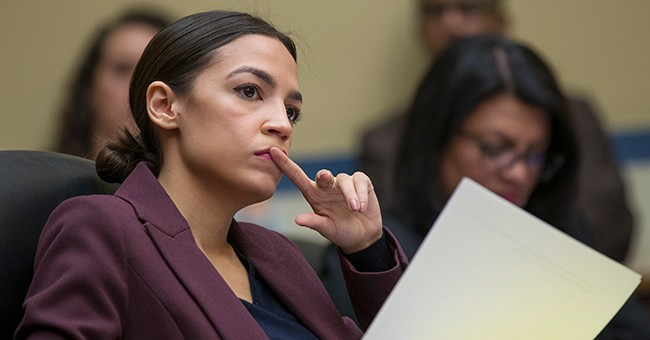 It’s stress-free down here,” Blanca Ocasio-Cortez told the Daily Mail… Her daughter raised eyebrows with her pitch to hike the top marginal tax rate on income earned above $10 million to 70 percent. She has also gotten behind the so-called Green New Deal, which would see a massive and costly government effort. The former Governor of Florida (and new Senator from the state) obviously is enjoying the fact that New York politicians are upset. Here’s some of what Rick Scott wrote in the Wall Street Journal. America is a marketplace where states are competing with each other, and New York is losing. Their loss is Florida’s gain… I would like to tell New Yorkers on behalf of the rest of America that our hearts go out to you for your sagging luxury real-estate market. But you did this to yourself, and you can fix it yourself. If you cut taxes and make state and local government efficient, maybe you can compete… I made more than 20 trips to high-tax states like California, Connecticut, Illinois, New York and Pennsylvania to lure businesses to Florida. The tax-happy leaders of those states were furious, which made the visits all the more enjoyable for me. They called me every name in the book. But they were the ones who raised taxes, and bad decisions have consequences. The elites in New York and Washington should commission a study of Florida to see what happens when conservative ideas are put into practice. …Florida’s economy is thriving, expanding at a record pace. …There’s a reason Rep. Alexandria Ocasio-Cortez’s mom left New York for Florida. And there’s a reason companies are fleeing high-tax states, bringing jobs with them to Florida. 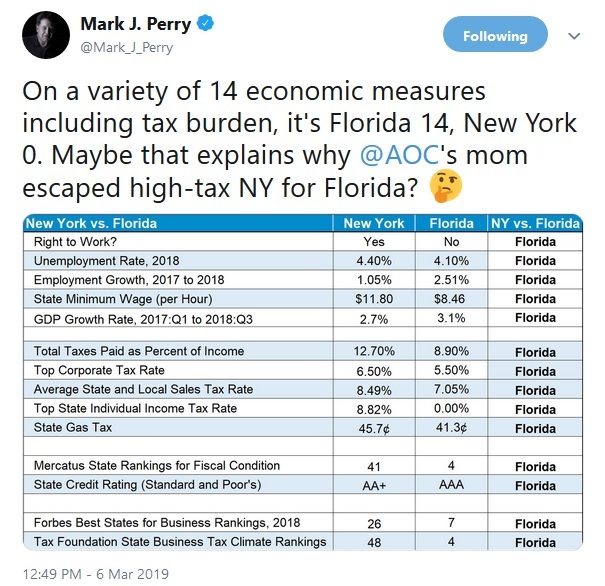 I mentioned above that having no state income tax gives Florida a big advantage over New York. Courtesy of Mark Perry, here a comprehensive comparison of the two states. Wow. If this was a tennis tournament, the announcers would be saying “game, set, and match.” And if it was a boxing contest, it would be a knock-out. The bottom line is that we should expect more rich people to escape New Yorkand move to Florida because they’ll get to keep more of their money. And we should expect more lower-income and middle-class people to also make the same move because Florida’s better policy means more jobs and more opportunity (sadly, Rep. Ocasio-Cortez has learned nothing from her mother’s move). P.S. New York actually doesn’t do terribly in nationwide rankings for pension debt, though it is still below Florida.